You can now 1-click duplicate & deactivate products in your Merch stores. Note that deactivating will hide products in your Merch store and make them invisible. Sort an overview of your Printavo Merch Stores by Store Name, Start or End Date, Total Sales, or Store Status (Live or Closed). 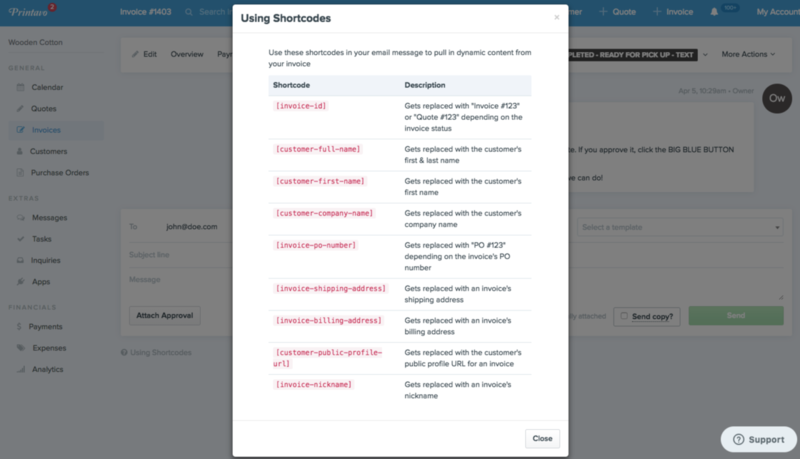 You can use shortcodes within Printavo Invoices to send email messages with dynamic content about your Printavo Invoices and Customers. Combined with Status Change Notifications, automated reminders and notifications are possible. [customer-company-name] - Returns the name of the Customer's Company. Easily use the customer's company in any correspondence or internal communications! [invoice-po-number] - Returns the PO number for that Printavo Invoice. No more copy/pasting invoice numbers! [invoice-shipping-address] - Returns the Shipping Address for that Printavo Invoice. Quickly and easily enter entire shipping addresses! [invoice-billing-address] - Returns the Billing Address for that Printavo Invoice. Get billing info easily with a shortcode! [customer-public-profile-url] - Returns the URL for the Customer's Public Profile in Printavo. Send a link to the job and know it's always the right link! [invoice-nickname] - Returns the Nickname given to that Printavo Invoice. Easily refer to the exact Invoice you mean! We've been working hard on Printavo Merch! More than 700 shops are using Merch [Beta] to run their online stores! Thank you for your feedback and patience as we develop long-term solutions to make Printavo Merch a quick, secure, and simple online store experience. Printavo Merch allows you to create online stores in minutes. You can simply create group stores for team orders, fundraisers, company stores, and more. Online stores have become an essential sales tool for growth in print shops. Shops can help their customers sell more, collect sizes, allow for individual payments, fundraise and more with Printavo Merch. Group e-commerce platforms have generally been complicated to use taking time to set up and deploy. When stores are done, orders have historically had to be manually copied back into a production management tool. Printavo Merch simplifies this process by allowing for quick store creation and collapsing of orders back into invoices to manage. Teams wanting to collect orders or run boosters to fundraise for the team. Paper order forms were sent around to be filled out with checks for payment. Coaches and group organizers would have to sift through forms, checks, and cash to make sure the totals were correct. Completed group orders were then left all in a box, not separated for each distribution by the coach/group organizer. Group organizers can 1-click approve the quote which lets the shop know they're ready for a store. Here is an example store. Orders are then collected through the store via individuals paying separately. Using 1-click, all unfulfilled orders are copied into a new invoice for production management. When viewing order history, duplicate shipping label records will not be created. Surely Printavo will start publishing changelogs very soon.